This recipe is perfect for late July, when the market is full of fresh green beans, potatoes, and tomatoes. This version is adapted from The Gourmet Cookbook -- I took out the lettuce because I think the salad is great (maybe even better) without it, and also took out the green pepper. I added the olives, but not capers, because the two of those together is a bit too strongly flavored for my taste. 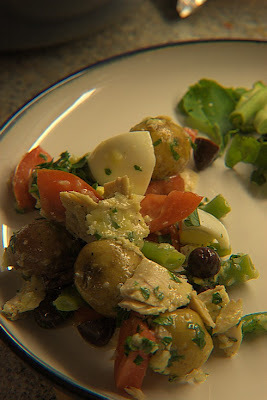 I also changed the cooking process a bit to cut down on the number of dirty dishes, and a number of smaller adaptations are noted in the recipe...this isn't the quickest salad to put together, but it makes a filling, complete meal. I don't measure my ingredients for recipes like this -- I just use what we have on hand and estimate the amounts needed to make the dish balanced. Its hard to go wrong with this one. Salad: Combine potatoes and cold well-salted water to cover by 2 inches in a heavy saucepan and bring to a simmer. Simmer, uncovered, until just tender, 15-20 mins. Remove potatoes with a slotted spoon and drain in a colander. Add beans to the same saucepan and boil until crisp-tender, about 5 minutes. Drain in a colander, rinse under cold water to stop the cooking, drain and pat dry. When cool enough to handle, peel potatoes (if you want, I never do) and halve or quarter them, depending on their size. 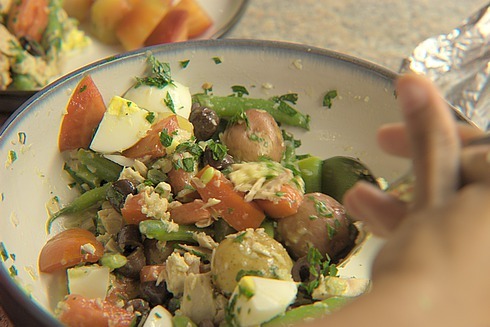 Toss potatoes with beans and 2 tbs dressing in a large bowl, and salt to taste. Top with eggs, tomatoes, and tuna chunks. Drizzle more dressing (as much as you want, you don't necessarily have to use all of it) over salad, and top with olives and parsley. This is best served immediately, but makes a decent cold lunch the next day. * To make the perfect hard-boiled egg, according to Gourmet, and tested by me with success, put the eggs in a large heavy pot and cover with 1 1/2 inches of cold tap water. Partially cover the pot and bring water to a rolling boil. Reduce heat to low, cover pot completely, and cook eggs for 30 seconds. Remove from the heat and let eggs stand in the hot water, still covered, for 15 minutes. Then run the eggs under cold water for about 5 minutes to stop cooking and prevent yolk discoloration.